Why go through the hassle of rebuilding a classic car? There was a time when I would take daily scrolls on AutoTrader or eBay looking at Porsche’s, Mercedes and BMW’s, thinking to myself, “let’s see…if I had the cash today, what would I buy?” You can call it attraction or just plain simple luck, but that day came one afternoon when I received my first check after flipping a house. Boy, was I on cloud nine! Never did I imagine that I would have an extra couple grand to play around with. One would assume after hearing this that I would have purchased one of those Porsche’s or BMW’s, because by all means, I became an expert at how much each model cost and what interior colors matched with it’s exterior counterpart. After tossing the idea back and forth with what to purchase, I started to see more and more of each of these cars driving around town. Funny how that always happens. As each one would pass me by, the sublime feeling of owning one of these daily scrolls I use to take on the Internet slowly diminished to a point where I no longer wanted to be the “average Joe” owning one of these vehicles. I came to the realization that if I wanted to make a presence, especially when it came to business meetings, a nice and shiny Boxster or Cayman might grab their attention. But only for a decent moment until I pulled away from their sight. What really would make an impression would be if I pulled up to those very same business meetings in a classic automobile. Driving up where I can pull at all those memory strings of their first experience with this type of classic and, if I can just hope, be remembered a bit longer. Just long enough to associate my name with either my print shop or my creative agency. This was when I decided that I wanted to buy a classic car. And it did not take long to stumble upon one to purchase..
One of the greatest conveniences with living in sunny Arizona is the ability to find rust-free classics sitting in driveways. With all the senior communities in Mesa, this was not a difficult feat. One day while my wife and I were on our way to the local Sprouts, we happen to see a ‘For Sale’ sign peeking beneath a dust infested car cover of what appeared to be a Cadillac. The totem pole headlights were looking at me while being parked in the senior community that provided me with an indication that this was in fact a Cadillac. Quickly asking my wife to turn around, we drove up to the house and knocked on the front door. After a few seconds, a gentle mannered man answered the door. Upon asking if the car was for sale, the reflexes on this man turned one-hundred and eighty degrees to that of someone thirty or forty years younger. His expressions and movements became swift-like as he grabbed the keys to his classic to show me his pride and joy. This was when the story came to fruition—something that a newer vehicle will never have and is exclusive to classics. A classic vehicle’s story is the building blocks to the soul; the DNA that gives the car character and style. Little did I know that the stories with this classic would continue with each occurrence of driving this beauty. After spending a few hours talking with the owner, I made an offer and he accepted. 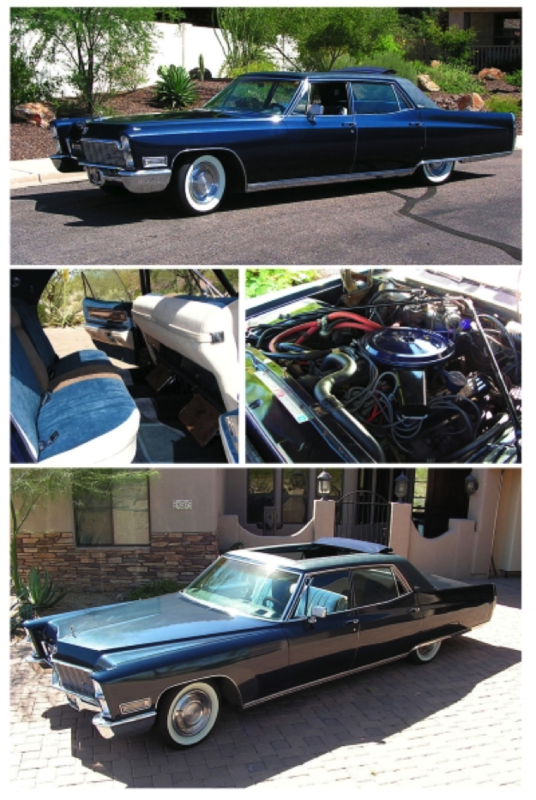 I remember the first time driving that 1968 Cadillac as if it was my first kiss. I was proud to be in the possession of a vehicle with such stature. The glances and thumbs up were instant at each red light. But there was definitely work to be done in order to make it driver friendly. To begin, the 472 cubic V8 engine needed some caressing. This included new spark plugs & wires, electronic igniter, distributor cap, electronic distributor coil, and a rebuilt carburetor. In addition to replacing all the hoses and fittings that the Arizona desert can wreck havoc on to a typical classic, the left and right wheels cylinders were replaced with the calipers quickly to follow. The wheel seals, thermostat, PCV valve, and vacuum hose were not forgotten. Wanting to add some personal touches to the Caddy, I opted to do what many have considered a taboo in the course of restoring a classic automobile. Of course, I am far from following the footsteps of the herd so I decided to reupholster the interior with a custom three-color theme that is definitely not a factory option. The original stereo was left untouched in the dash, but I added an Eclipse CD Navigation head unit with matching Kenwood amplifiers and Polk Audio speakers and accompanying subwoofers for the lower frequencies. And to give a big middle finger to the mainstream restoration junkies, I cut a 40”x55” rectangle out of the roof of this four-door sedan and installed a sliding ragtop to let the vitamin D absorb me and my passengers. Being this was not a convertible, this is the next best thing. Screw driving with the windows down. Slide the rag top open and let the wind flow like a haboob that we Arizonans have learned to respect. Next on the list for this Caddy is to work on the body. The paint still shines but there is noticeable dents and chips from the previous owner that I would like to repair. In addition, after purchasing a set of BFGoodrich Silvertown with 3” whitewalls for the Caddy, I decided to purchase some ‘57 Cadillac Wheel Covers with 3” bullets. Still in the box, I am thinking this will definitely add some strands to the already unique DNA. So, why go through the hassle of rebuilding a classic car? Because there are plenty of folks driving around in Porsche’s, BMW’s, and Lexus’s. Why be another sheep? Now, if I can just get the wife to stop using the Cadillac as a bumper stop for when she opens her car door in the garage, I’d be set to start on the bodywork. Levi Leyba is an entrepreneur in Mesa, Arizona. When he’s not helping people start their biz at StartABiz.org, he’s consulting and building websites atOwl5.com and PrintDonkey.com.